BANC PUBLIC is a sketch comedy webserie. Just awarded in Los Angeles for "Best writing - Translated Comedy", BANC PUBLIC webserie needs your help to raise enough funds to shoot its 2nd season, with even more stories and hilarious characters !!! BANC PUBLIC (Public Bench) is a sketch comedy webserie. "Chronicles of a public bench, silent guard of anecdotes left daily to its discretion." 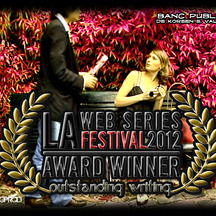 Just awarded in Los Angeles for "Best writing - Translated Comedy », BANC PUBLIC webserie is cooking its second season with even more stories and hilarious characters !!! Ten new 3-minutes episodes with a dark, absurd, sometimes caustic humor, describe gatherings, collisions, slices of life of various persons and things, meeting on a same public bench. BANC PUBLIC is a free-broadcasted webserie, aiming at appearing on a national television channel, after Martinique Première (French regional TV channel) : who knows? - Official selections at Marseille Web Fest 2011, Festival d’Alès 2009. Awards give us wonderful reasons and motivation to pursue, but they're not funds... so we need your support to make it happen! BANC PUBLIC - SEASON 2 ...so what? - New talented actors ! - Laugh, laugh and laugh !!!! An old school gangster who teach the business to his stupid nephew, a father who tries desperately to find a regular baby-sitter, a weird wedding anniversary or the epic meeting of a business man and homeless persons.... And a lot more of characters et surprises !! Collected funds will cover a part of the costs to make the 10 episodes of the season: one week shooting, the editing and some publicity material for the webserie. Thanks to all voluntary actors and crew giving their talent and sharing their equipment to complete the budget !!! Your support to BANC PUBLIC season 2 is a precious help to raise more funds for the broadcasting and the promotion of the serie... on the web and more! - 400 euros for the set management and for at least a hot meal for the team ! 500 euros for the media supports : DVD, posters, Beta, etc. A THANK YOU from the team !! You are a super-sponsor!!! Previous rewards + BANC PUBLIC Saison 2 clapperboard !! !